class="post-template-default single single-post postid-4935 single-format-standard wpb-js-composer js-comp-ver-3.6.12 vc_responsive"
Whether it is in pots, containers or in vegie gardens, no matter the situation there is nothing better than growing and eating your own vegetables from your own garden. Tomato & Vegie Liquid fertiliser is the ideal fertiliser for all your edible plants including, tomatoes, herbs and vegetables. This unique formulation provides the benefits of blood and bone with natural growth stimulants in an easy to use liquid form. 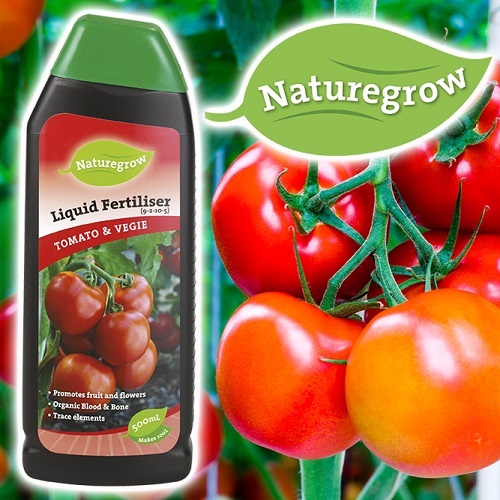 Naturegrow Tomato & Vegie Liquid Fertiliser provides an effective balance of major and minor plant nutrients and can be absorbed through the plant leaves as well as the root system. Naturegrow Tomato & Vegie Liquid fertiliser enhances soil fertility by encouraging beneficial soil micro-organisms. Contact your local IGC store via our Store Locator page for further information.